Chipboard box is filled with shredded paper and a surprise. 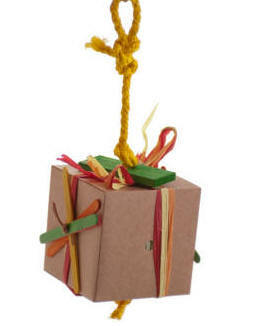 They are hung from sisal with a wooden slat on top for more chewing fun. 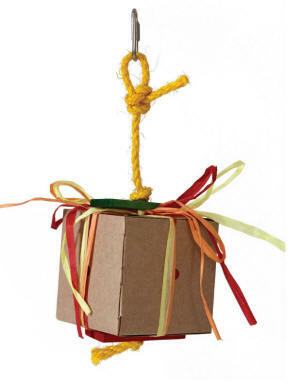 A great opportunity to turn this into a foraging toy ... add some of your parrots goodies to the box (whole nuts, dried pasta, popped corn, etc). The large is topped with a nickel plated pear shaped quick link on the top and the small just has the loop so you can use your own method for hanging.